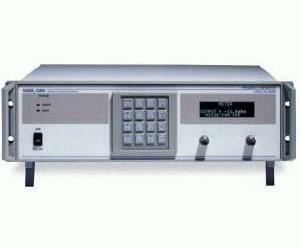 The UFX-EbNo is a fully automated precision signal to noise generator that sets, and maintains a highly accurate ratio between a user supplied carrier and internally generated noise, over a wide range of signal power levels and frequencies. The internal power meter provides repeatable SNR waveforms for accurate signal generation. The instrument gives system, design, and test engineers in the telecommunications industry a single tool to generate precision signal to noise ratios. These signals are used to compare theoretical BER to SNR ratios, found in “waterfall” type graphs, with measured values from the DUT to evaluate different modulation schemes. Users can obtain higher yield through automated testing, plus increased confidence from repeatable, accurate test results. Standard units can be modified for specific customer requirements. Please consult the factory for pricing and availability of these requests.